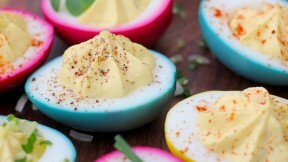 For an Easter appetizer or hors d'oeuvres, food blogger Aube Giroux shows you how to naturally dye your eggs for a festive deviled eggs dish on the Kitchen Vignettes blog. To make the dyes, bring to a boil 3 small pots filled with 2 cups of water per pot, along with the magic ingredients in each one (beets, red cabbage, turmeric). Simmer in a lidded pot for 20 to 30 minutes and then remove from heat. Strain out the solids so you are left with 3 brightly colored liquids. Add 1 Tbsp of vinegar and 1 tsp salt to each pot of dye. In the case of the red cabbage dye, also add 3/4 tsp baking soda to create a blue hue (or leave it as is if you prefer purple). To prepare the eggs, place them in a medium-sized pot filled with enough water to cover the tops of the eggs with an inch of liquid. Bring the water to a boil and then turn off the heat. Leave the eggs in the water, cover with a lid, setting a timer for 12 minutes. Remove the eggs after 12 minutes and transfer them to a bowl filled with ice cold water. Let them cool for one full minute. Remove from the cold water and lightly crack the shells on a hard surface, peeling the eggs carefully, making sure to leave the flesh intact. (*Note: freshly-laid eggs do not peel well. Make sure you use eggs that are at least a few days old for this recipe). Place 3 peeled eggs in each pot of dye for about one hour (more or less time will give you varying intensities of color). Once you are satisfied with the color of your eggs, remove and dry gently with a paper towel. Slice the eggs in half and remove all the yolks. Place the yolks in a bowl with the 1/2 cup of Greek yoghurt, 1 Tbsp. dijon mustard, 1 Tbsp. chopped onions, and 1/2 tsp salt. Puree with a hand blender. Either spoon this mixture back into the hollowed egg halves, or if you want to get fancy, place the yolk mixture into a piping bag with a large cake decorating attachment and pipe it into the egg halves.